Why would all these people be coming to this obscure graveyard? 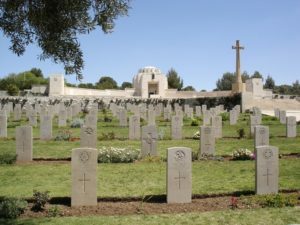 The caretaker could not understand the sudden interest in the nondescript grave of a teenage soldier who had died during a skirmish in the British Mandate of Palestine more than 60 years earlier, in 1939. The teenager, named Harry, had lied about his age – adding two years – so that he could enlist in the army. He was following his father, a shoemaker, who had been wounded during the Battle of the Somme in World War I.
Harry was accepted and became a member of Britain’s famed Worcestershire Regiment, 1st Battalion, one of the oldest Britain fighting forces. Dating back to 1694, it was begun by Col. Thomas Farrington, a member of the Coldstream Guard, as Farrington’s Regiment on Foot. In 1751, it was renamed the 29th Foot Regiment. In one of their engagements, they were beaten decisively by the American colonists at the Battles of Saratoga in September and October of 1777. But 1939 was peacetime. 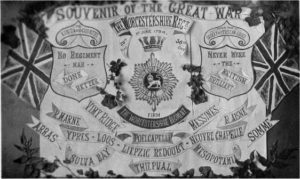 Harry’s regiment, stationed in Palestine as part of the British garrison there, did not have much to do. Harry and his buddies would go swimming in the afternoon. 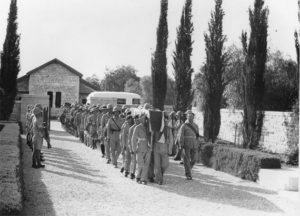 On July 22, 1939, they were on the Hebron-Beersheba Road, going back to their barracks, when they were attacked. 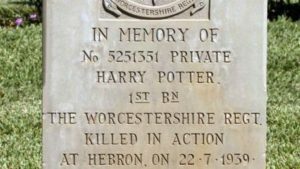 So why did Harry’s grave, in the Commonwealth Cemetery in Ramla (currently part of Israel) suddenly start receiving so much attention? Because Harry’s last name was Potter. Someone finally told the caretaker that there were a lot of very popular books about a teenage wizard named Harry Potter. 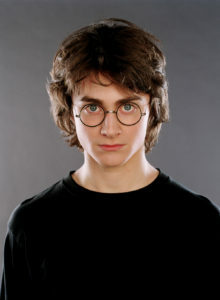 Actor Daniel Radcliffe who played Harry Potter in film.